It can be so tough choosing a place to go on holiday that will keep your kids entertained as they expend that seemingly endless energy. Luckily, France’s Limousin region is packed full of activities that the whole family can enjoy and all are easily accessible from La Croix Du Reh Bed and Breakfast. 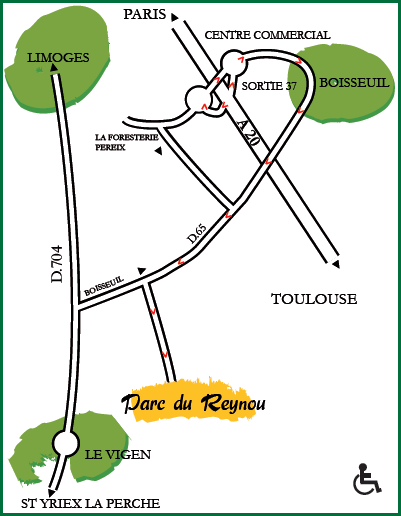 One such place is Reynou Park, a stunning 300 acre nature reserve just 45km from Châteauneuf – la Forêt where La Croix Du Reh is located. It boasts a beautiful zoo that houses over 600 animals and birds of over 130 different species across five continents of the world. Let your kids lose as they encounter the wonders of pelicans, lions, pumas, giraffes, lamas, zebras, macaws, cappuccino monkeys and many more. The landscaped grounds are also home to amazing walks where you can enjoy beautiful bridges, naturally carved caves and crystal clear waterfalls at your leisure. Take a picnic and enjoy the scenery. At La Croix Du Reh, we can even prepare a delicious lunch or a packed picnic basket for you to take with you. Just ask. For adults, the place is full of history. Reynou Park is organised around a stunningly beautiful castle built in the 18th Century by Jean Peroche, a famous colonel of the burgesses militia. It was then taken over by Charles-Edouard Haviland, a famous american porcelain manufacturer, in the early 1800’s. Charles immediately went about making huge changes to the building, adding two extra wings, extensions to the north and south sides of the house, creating a stunningly large lounge, adding stables, saddle and other rooms to suit his family’s extravagant lifestyle. A fan of optimising space, Monsieur Haviland worked to maximised natural light and ensured beautiful acoustics throughout the well-thought out 27 rooms that between them share 72 windows. The house changed hands once again in 1996 and was taken over by a private company that discovered its many hidden treasures and make it into what it is today. Getting there could not be easier (see map*) and we will always be glad to point you in the right direction.